Bring some warmth and cosiness into your kitchen with your own personalised kitchen rugs. Create your own custom kitchen runners featuring your photos or artwork to add some flair to your home. Choose from six unique styles and sizes with the option to add natural cotton fringing, with each rug made from a luxurious velvet fabric for extra comfort. The kitchen is often one of the busiest rooms in the house, so why not give it an extra splash of style with personalised kitchen rugs? Whether your kitchen is open and spacious or quaint and cosy, we have over 6 different sizes and styles of rugs to suit the space. A vibrant, large rug covered in happy snapshots of your holiday would make a welcome addition to the room, and customised kitchen runners are ideal for narrower spaces. Our short pile Velvet Shimmer fabric feels sumptuous beneath the feet and gives the rug a feel sense of luxury, along with the option to add natural cotton fringing. With an anti-slip base, your personalised kitchen rugs won’t slide around on tiled or wooden floors. Ordered a personalised rug and mouse mat. The website was easy to use and delivery was fast. The quality of both items was excellent but it has to be said that the photo collage rug was amazing :) Would definitely recommend this’s site. After receiving the custom rug, we were very happy with it's outcome. The quality is better than we had anticipated and the team at BagsOfLove were proactive about meeting out tight deadline. Your new personalised kitchen rugs are made using Velvet Shimmer – a soft short-pile fabric, with a lovely delicate shimmer that catches the light. This fabric is perfect for showcasing bold and beautiful, brightly coloured designs, and will bring your images to life. The backing of the rug features an anti-slip rubber base, adding stability and strength to the piece. Our sublimation dying process means that inks are fused directly into the fibres of the rug to create a long-lasting print, which will not rub off over time. This printing method creates a noticeable odour, this is totally normal and will air out in a few days. Every rug is printed and then sewn onsite by our skilled makers who are all based in our London factory. Care: To keep your new kitchen rug clean and fresh, give it a vacuum occasionally. Do not clean in the washing machine, but if necessary use a damp cloth to keep your rug in top condition. Add a Moroccan inspired patterned rug to your kitchen to add some exotic vibes to every dish you create. Warm tones and fiery patterns will create a stunning centrepiece, and tie together colour themes of the room. If you have wooden or tiled floors, opt for the natural cotton fringing to add an extra touch of luxury and elegance. 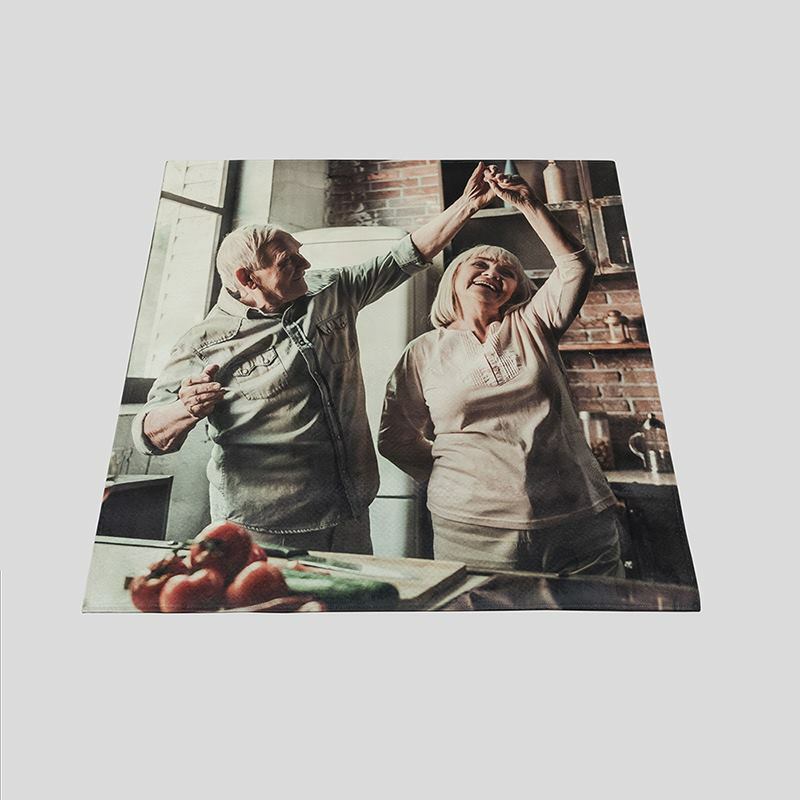 These kitchen rugs are perfect for any keen chefs, or simply anyone who loves spending time in the kitchen. They add a ‘home comfort’ feel to tiled floors, as well as injecting some serious luxury. Customised kitchen runners are an excellent way to bring some colour to the room if your kitchen is smaller and you want to add a personal touch without taking up too much space with furnishings. Have your table decorated with your own custom table runners for your setting. Complement your delicious work from the kitchen.